Certification Program What is a “Cadet” Scout? 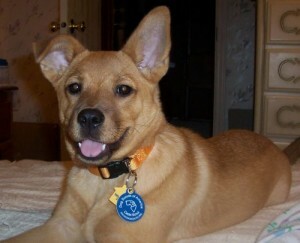 What do you call your dog before he or she gets the Dog Scout title? This will be an optional title for your dogs. To get this title, you will need to pledge to uphold the Dog Scout Laws and conduct yourself (and help your dog conduct him/herself) in a manner befitting a title from Dog Scouts of America. Remember that when someone knows you are representing an organization, you are an ambassador for all other members of that organization. People will judge the entire organization based on your actions and attitude. We will keep track of the dogs with this title and provide a nice collar tag in return for the $5 fee per dog which also covers the time spent on updating the dog’s records, mailing the tag and producing the tag. This can be paid on-line when you renew your dues or when a new member joins. 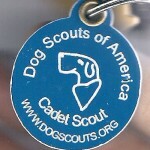 So now, if you choose to participate in this program, you can proudly tell people your dog is a Cadet Scout, like Genesis!